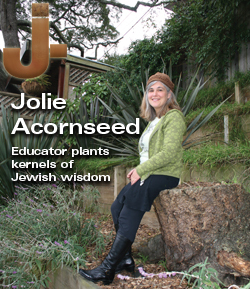 Jolie Acornseed: Educator plants kernels of Jewish wisdom – J.
Jolie Egert is a plant whisperer. A Jewish plant whisperer. She’s also a bit of an evangelist — for acorns. The Fairfax-based educator, botanist and herbalist is such an enthusiastic proponent of the ancient nuts, in fact, she is known to don squirrel puppets and a felt acorn hat while giving presentations about them. Egert, who offers classes, workshops, walks and more through her consulting organization, Go Wild, will lead “Earth-Based Jewish Ethnobotany,” a walking tour at Oakland’s Redwood Regional Park on Feb. 12, part of Wilderness Torah’s celebration of Tu B’Shevat. 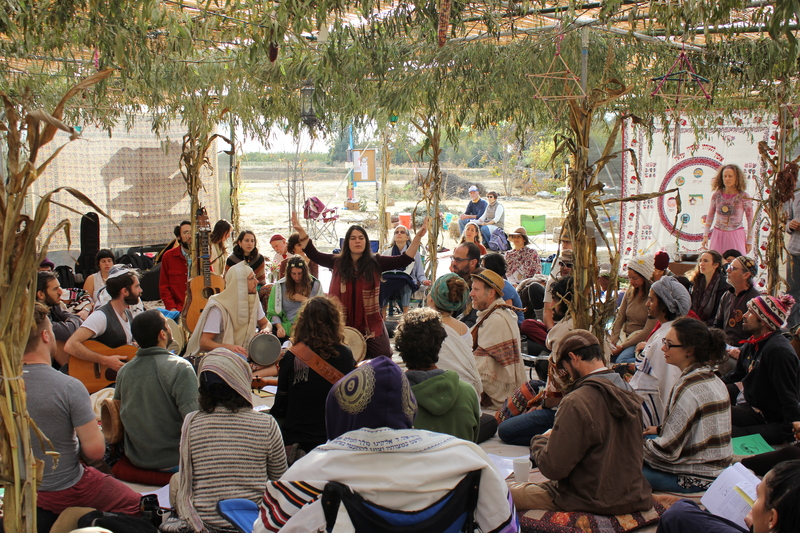 Wilderness Torah explores spirituality through nature, organizing outdoor events that emphasize the seasonal aspects of Jewish holidays. Tu B’Shevat, also known as New Year of the Trees, starts Tuesday evening, Feb. 7. Infusing her tours with Jewish wisdom, Egert points out that the Hebrew words for one (“echad”) and together (“yachad”) come from the same three-letter root. She uses this to illustrate how every separate thing in nature is linked, and thus unified, through metabolic cycles and energy flows. “You can’t have one without it being together with something else,” she says. And all of this connection starts from the sun. Egert shares her enthusiastic, uncommon understanding of nature on a recent stroll through Golden Gate Park, singling out plants with a connection to Jewish heritage, noting whether they appear in the Torah or served a purpose in ancient Israelite life. She stops by some acacia trees, which will be bursting with sunny yellow flowers in mid-February. “When the Jews were wandering in the desert, they made the poles of their tents from acacias,” she notes. Egert, 42, views Judaism as an Earth-based tradition, in which many religious practices are holdovers from before and during the advent of agriculture. She hopes her Jewish-themed walks, which she has led for Wilderness Torah and other Jewish groups, help the People of the Book rediscover their origins in nature. Stopping by a bank of brookside willows, she mentions another seasonal holiday, Sukkot. “A willow is part of the lulav that we wave at Sukkot, along with the palm, the myrtle and the etrog,” she says. Walking into a small grove of oaks, she notes that similar evergreen trees cover Israel. The Northern California climate is similar to parts of Israel’s Mediterranean climate, she says, so many of the same plants thrive in both places. Torahs historically have been written with ink made from oak galls, which are leaf buds that have ballooned into small globes that incubate wasp larvae, she says. The tannic acid in the oak galls is combined with other vegetable ingredients to make a durable kosher ink that is still used today by Torah scribes. While standing amid the majestic, sinuous trees, Egert explains that an oak’s acorns — contrary to widely held belief — not only are edible but are even good for you. Over the past few years, Egert has become Jolie Acornseed — teaching herself the process for preparing acorn flour, which she says also was the primary carbohydrate in the native Californian diet. She believes acorns fit in well with the prevailing taste for gluten-free, local, sustainable food and predicts that we’ll soon be ordering acorn pancakes for brunch at hip restaurants. In the fall acorn season, Egert leads highly interactive family workshops in which she demonstrates drying the nuts and leaching out their tannins and then has volunteers crack them open and grind them into flour. Some workshop participants are skeptical at first about the taste but usually are won over after they try Egert’s goodies. “It’s like any kind of grain, like oats or something. 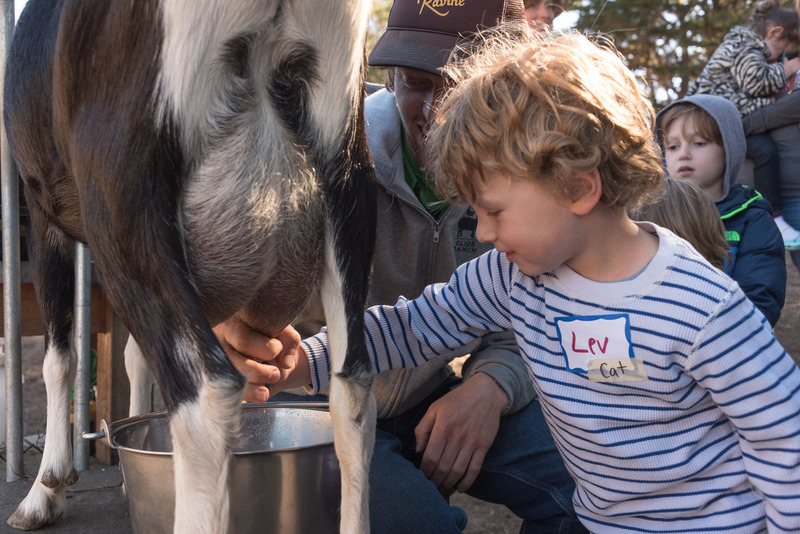 It just matters what you mix it with,” says Jen Wang, who attended a workshop Egert led at Hidden Villa Farm in Los Altos Hills last September. At other events, Egert teaches people how to transform nuts from California’s ubiquitous bay laurel trees into sweets that taste like chocolate, and advises aspiring food foragers about which wild plants are safe to pick and take home for dinner salad. On her own culinary adventures, she goes mushroom picking with her husband, David Egert, a biology instructor at the College of Marin (who knows precisely which fungi to pick — and to avoid). But much of what she teaches has to do with another kind of sustenance. Growing up in the suburbs of Long Island, N.Y., Egert always found solace in nature. “When I was in nature, the loneliness of my childhood receded and I could trust in myself and the magnificence of life,” she says. Egert understands that time in nature can be profoundly healing, especially for children in urban environments. So she’s excited to work with city kids, introducing them to the sights, smells and tastes of the Bay Area’s green spaces. Even if there’s no oak grove or redwood forest nearby, Egert likes to remind her students that nature doesn’t have to be a separate space. Wilderness Torah’s Tu B’Shevat in the Redwoods starts at 10 a.m. Feb. 12 at Redwood Regional Park, Oakland. Meet at Skyline Gate. $30-$35. www.wildernesstorah.org, www.gowildconsulting.com. Living-room Torah study: It works in Berkeley, but will it fly in Boston?